I'm a husband, father, son, brother, pastor, and friend trying to strengthen his grip on his life, purpose, and health. Yesterday, I attended a memorial service for the 5-month-old grandson of a friend of mine. Little P.J. had Fanconi Anemia. The service was succint and hopeful. The officiating pastor did a masterful job of leading us through what is arguably the most difficult type of funeral to do. I've only done funerals for adults; none for kids and especially none for infants. The pastor stepped up to the challenge and did it in a gracious and loving way, offering hope and help without being preachy or overbearing. A slideshow of photos of P.J. was shown, as well. Very moving and emotional. The pastor quoted P.J. 's Mom as saying that she loved him since the stick turned blue!' Everyone laughed. I imagine the impact of this loss will be felt for a long time to come. Yesterday was also the 11-yr-anniversary of the passing of our son, Steven Chandler Skinner. He was born at 22 weeks, and died shortly thereafter the same day, for obvious reasons. Vital organs and systems aren't quite far along enough at that point to sustain life. The honest truth is, I don't believe I've completely worked through that. It's still very painful. This is the kind of thing Mom needs to put on the Hope for Henry Foundation blog. It is an email from one of the people we work with at Georgetown. Hope for Henry bought a laptop with a built in microphone and speech recognition for a boy named Jabie who is being treated at Georgetown and who is losing his sight. All in your name and your memory. Thanks for making this happen. 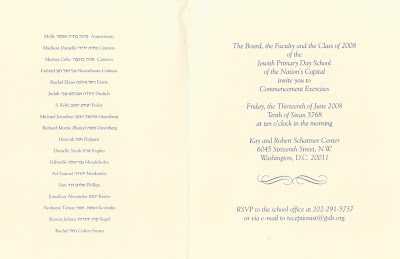 Elie Wiesel came to visit JPDS yesterday, and then spoke later in the evening at the Synagogue at Sixth and I. That is where Jack will be Bar Mitzvah'ed next December. Your brother and Dani Kupfer were chosen to ask Elie Wiesel a question. I was proud of Jack to get that honor. He did well. Yesterday was a really special day for JPDS, one of those that will stay with us for a long time. This morning, we were all basking in the glow of Elie Wiesel’s visit to our school and his conversation with Leon Wieseltier in the evening. It was an uplifting experience, which I hope will stay with the children forever. The connection that Elie Wiesel established with each child, his warmth, and his outlook of faith and hope on life, were truly inspirational. I am sending you the links to some of the press coverage. Enjoy it, especially the video clip in which Mr. Wiesel sings for the children. It may bring tears to your eyes, as it did to mine. Check out Ari and Max Kanefield! This was the Bar Mitzvah group of 2009's Lag B'Omer/Memorial Day get-together. We do stuff with other families having bar mitzvahs next year. We came out to St. Michaels for Memorial Day. Andrew and Tracey went to Canada, so we bought Emma and Sam with us. Nana and Papa drove Vasco out because we had no room in our car. Your brothers, cousins and Vasco did a lot of swimming in a very cold swimming pool. Too cold for me and Mom. One of the highlights had to be Jack losing two teeth in one day! Of course, like some baseball players we know, Jack was using performance enhancers. He bought caramels from the candy store in town. The other highlight... Joe went tubing! All by himself. He showed no fear. In a weeks time he has gone from being totally scared of the water to tackling it head on. We are all very proud of him. 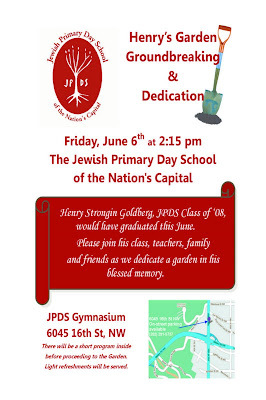 I made a flyer for your garden dedication. I want to put your face on it somewhere. I have a rule that you need to be on everything, so people never forget that it is a person - you - who we are remembering. For some reason when I put it on here it switched colors from blue to red. In fact, there is a whole lot of weird formatting going on here on the blog that I don't understand, but need to fix. I probably shouldn't have played Somewhere Over the Rainbow in your room as you lay in your comatose state and died. It ruined me for this song. Whenever I hear it I go right back to your room, which is a good thing, but I can't help but be incredibly sad. So, here it is again, but in a very beautiful and wonderful video that Uncle Andy made. It was shown at the reception after Michael and Rachel's B'nai Mitzvah. If you looked close, you can see you and Rachel. Here you guys are again. The Pearls meet their donor for Mothers Day. METRO VANCOUVER - A Port Coquitlam couple trying to conceive a "saviour child" to supply stem cells for their son with leukemia have now abandoned the effort because the eight-year-old has relapsed and needs a more urgent - albeit mismatched - transplant. Time has run out in more ways than one for Pam and Mike Obadia, both aged 47. The couple made national headlines last month when The Vancouver Sun wrote about their desperate bid to boost the survival odds of their son by trying - against biological odds - to create a test-tube baby. The baby's umbilical cord blood stem cells would be harvested at the time of birth and transplanted into their ill son, Benjamin. Since the reproductive technology was not offered in B.C., the couple had planned on going to Chicago. But during recent testing at B.C. Children's Hospital, the family learned that Benjamin had suffered the second relapse of his five-year battle with leukemia. Now he's on a more aggressive chemotherapy regime and scheduled to get radiation, then a transplant in July. Benjamin has been on an international registry for two years, but a matched donor has never been found for his unusual tissue type. So the transplant will consist of stem cells from umbilical cord blood of an anonymous source. Dr. Geoff Cuvelier, a pediatric oncologist at the hospital who is not involved in the Obadia case, said about 10 such mismatched cord blood transplants are done each year at the hospital. The goal of such transplants is to boost the immune system of the relapsed patient so it can attack the residual cancer cells left in the body that chemotherapy doesn't kill. Pam Obadia said she has been overwhelmed by the love and support from strangers and friends over what she and her husband had planned on doing. "Although we have to abandon Pre-Implantation Genetic Diagnosis (PGD) because there isn't enough time to wait, we want everyone to know how much we appreciate their universal support," she said in an interview. The primary purpose of PGD is to select eggs or embryos that are not affected by serious genetic, inherited diseases. But at some private reproductive technology clinics like the one in Chicago, the process is now also being used to find embryos that are a tissue match for an ailing sibling. It is not offered at hospitals in B.C. because of cost, and ethical and moral concerns about whether it is right to conceive a child for the sake of another. At B.C. Children's Hospital, parents of sick children are not informed the procedure exists as an option to pursue elsewhere; the Obadias heard about it from a friend. The process to create a saviour child starts with in vitro fertilization, in which eggs and sperm are incubated in a laboratory to create several embryos that are then screened to determine which to select for implantation into the mother's uterus. Pam Obadia's odds of getting pregnant were extremely low because of her age, and she admitted she was grasping for a miracle to save her son. "He's an amazing kid," said Pam, adding: "When we were on our way home from the hospital the other day, he actually thanked us for being there to support him. He is thrilled that our long-planned trip to Disneyland in June is still going to go ahead, thanks to the generosity of a friend who is donating a place for us to stay. "I am still so frustrated that I didn't find out about PGD years ago when Benjamin first got leukemia," said Pam, adding that hospital doctors don't believe there is any onus on them to fully inform patients about options like saviour children. Dr. Marcia Angell, former editor of the New England Journal of Medicine and a medical ethics expert at Harvard University, said in an interview she finds the hospital's position disturbing. "I believe the parents' actions were not only ethical, but admirable. There are a lot worse reasons for bringing a child into the world than this one. The Obadias have already shown they are extraordinarily loving parents, and there is no reason to believe they would love a new baby any less than the children they have. "The notion that somehow a saviour sibling would suffer psychologically is the rankest sort of speculation... The problem here is what I call busybody ethics. To justify their specialty, ethicists sometimes feel the need to wring their hands over everything -even something as clearcut as this," said Angell. To follow Benjamin's cancer treatment, go to the family website: www.mobadia.ca. Annette Locklear visits with Matt Pearl, to whom she donated bone marrow in 2006. PEMBROKE — Annette Locklear signed up to be a bone marrow donor when she was a high school senior. She never thought she would be called one day to save a life. That call came in 2001, when a representative of the National Marrow Donor Program Registry told her she was a close match for a child in Missouri who suffered from a rare blood disorder. Locklear, a teaching assistant at Deep Branch Elementary School, didn’t think twice about helping. “If it was my child, I would want someone to help,” she said. Locklear was honored for her gift of life on Mother’s Day weekend. She also met the boy, Matt Pearl, who received her bone marrow. Diane Pearl, Matt’s mother, wanted to thank the people who gave her the greatest Mother’s Day gift — saving the life of her two children. Matt, who is 11, and his 13-year-old sister Alex were diagnosed with Fanconi anemia, a rare blood disorder that leads to bone marrow failure. The disorder can affect the body’s organs, tissues and systems. Locklear, who is 30, and a 40-year-old woman from Sweden named Catarina Lindstrom visited the Pearl family in Missouri last week. “They gave me Mother’s Day every day,” Pearl said during a telephone interview from her home in Eureka, Mo. 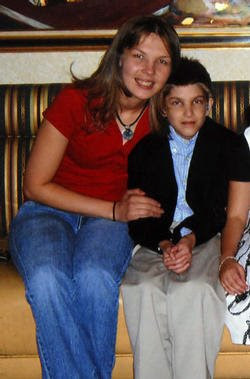 Alex received bone marrow from Lindstrom during a transplant in May 2001. Matt did not undergo his transplant until five years later. Pearl said Locklear’s tissue was a close match, but there was only a 50-50 chance that Matt would survive. The family searched for five years to find a perfect match. They hosted bone marrow drives. Nearly 100,000 donors were added to the registry. But, they did not find a donor who matched more closely than Locklear. During the search, Matt’s health started to deteriorate. The family asked the registry to contact Locklear so they could proceed with the transplant. 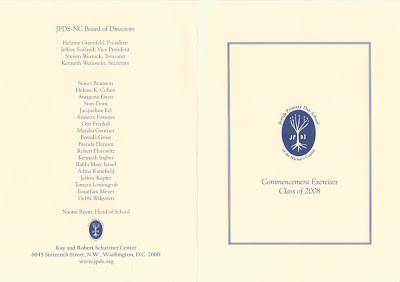 Locklear went to Chapel Hill on July 14, 2006, to have bone marrow removed from her lower back. The next day, several thousand miles away in Minneapolis, Matt received her bone marrow. The children could not meet or communicate with their donors until a year after the transplant, and only with the donor’s consent. Locklear checked in with a representative from the registry about Matt’s progress. It wasn’t until November that she heard from Pearl in an e-mail. Pearl expressed her gratitude and the desire to meet Locklear. They decided to meet in May. Locklear said she was nervous about her trip. Pearl felt a great sense of peace and comfort when she finally met Locklear and Lindstrom, she said. “It was like I had known them forever,” Pearl said. The children are healthier and happier, she said. “Matt knows she gave him something special,” Pearl said. Locklear received a necklace with a silver pendant with her initials on the front, along with Matt’s name and the date of the transplant on the back. She also was given a book filled with letters of thanks from friends and family, and stories about the children. “I am just a working mother with two kids, but I had people come up to me saying, ‘You don’t know what you have done,’” Locklear said as she flipped through the book. Pearl said it was hard to convey the family’s gratitude. Locklear said she now plans to become an advocate the bone marrow registry. Locklear said she would do it again. “Knowing what I know now, absolutely,” she said as she held her 2-year-old in her arms. Staff writer Venita Jenkins can be reached at jenkinsv@fayobserver.com or (910) 738-9158. Went to Mexico the past few days with Uncle Andy and Aunt Abby. Wrote a bunch. Will get it on here in a little bit. In the meantime, here are some pics of us. And yes, that is your Mom - and Aunt Abby - surfing. Big things happened this weekend. Michael and Rachel became B'nai Mitzvah. There were events starting on Friday night, but here is just a sample of the party from Saturday night for all the kids. We haven't seen Dr. Wagner in the news lately, and by the way the little guy who was so sick who he transplanted is doing okay now, but here is Dr. Hughes. I am writing this while I watch a documentary that I learned about from our friend Cindy Bullens. The movie is called Space Between Breathes. It is about parents who have lost children. A mom who lost her son just said how deeply you grieve is a measure of how intense you love. I loved you a lot. New advances in reproductive technology have pushed medical diagnostics to both theoretical and practical limits, according to Mark Hughes, MD, PhD, director of Genesis Genetics Institute in Detroit and director of the Applied Genomics Technology Center of Michigan, who spoke at the opening session of The American College of Obstetricians and Gynecologists' (ACOG) 56th Annual Clinical Meeting. "The rapid growth and clinical adaptation of genetically based information and technology are fundamentally changing the practice of medicine, especially for ob-gyns," said Dr. Hughes. Because of these advances, there are technologies now available to couples wanting to avoid inherited disease in their offspring even before a pregnancy begins. "Knowing the roadmap of the human genome gives us powerful tools to help our patients in ways we might barely have imagined just a few years ago," added Dr. Hughes. "In ob-gyn this information presents especially complex practice dilemmas." The field of reproductive medicine, perhaps more than any other field, is continually confronted with ethical considerations. "Just because we technically can do something doesn't mean we should," noted Dr. Hughes. "Through the ages, technology has been the fuel that drives the engine of science, and science is the vehicle that propels the progress of medicine, and medicine routinely drives us into bioethical corners. "Preimplantation genetic diagnosis was invented 18 years ago, and it's come a mighty long way," said Dr. Hughes. "It is now possible to detect quite complex problems in the smallest unit of life (one cell), in the smallest unit of inheritance (one gene), for the smallest part of a gene (one DNA nucleotide), out of 3.3 billion letters that comprise the human genome. "Even in 100 years of medical advances, diagnostics will not be smaller than examining-overnight-one molecule. The technology itself will surely evolve with time, but we are now at the limits of the biology that can produce severe pathology in our patients," added Dr. Hughes. Preimplantation genetic diagnosis (PGD) is a reproductive technology used with an in vitro fertilization cycle. It involves testing the genetic material of embryos to look for specific genetic mutations or chromosomal rearrangements. It is generally used by patients who know they are at risk of transmitting a genetic disease or chromosomal abnormality to their offspring. For example, a couple could face a 25% or 50% risk of a producing a child with a particular disease. This risk is not trivial, Dr. Hughes said, and many couples choose not to have children. Other couples may accept this high risk and wait anxiously during the first months of pregnancy, wondering if their fetus has cystic fibrosis, muscular dystrophy, hemophilia, or any one of hundreds of genetic disorders. "Their anxiety is significant. Do they want diagnostic testing such as chorionic villus sampling (CVS) or amniocentesis, and what will they do with the information after they have it?" commented Dr. Hughes. "By testing a fertilized egg prior to implantation, modern science can now eliminate this risk and this stressful time for couples." PGD has largely been used to help couples who suffer with infertility and for couples at risk of having children with a heritable genetic disease. The concern now, however, is that the technique might be used to select characteristics that range from less serious disease to purely matters of preference, such as gender. "Who decides what's ethical and what isn't?" asked Dr. Hughes. "It varies from one country to the other." Dr. Hughes points out that while most people approve of a couple finding out before implantation whether an embryo has a lethal disease, the discussion becomes murkier when it concerns a non-fatal disease or condition or even gender.